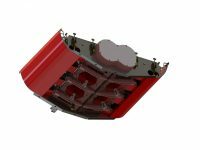 This new revolutionary system allows for expedient conversion of your aircraft from dry or liquid applications to an aerial Firefighting asset. The Switchback system integrates the Transland/DynaNav controller which provides the capability to control both the ag and fire gate all from a single unit. The controller features an intuitive touch screen to select the desired drop ratio (¼, ½, ¾, or full salvo). Control options include selection for level 1 to level 6 drops. The Switchback fire gate features dual longitudinal positioned doors similar to the Transland 10″ gate. Hydraulic actuation uses an accumulator with the capability to perform manual or hydraulic emergency dumps and facilitates foam injection. Transland’s revolutionary configuration allows your Ag Spray system to be mounted while the switchback fire gate is installed. 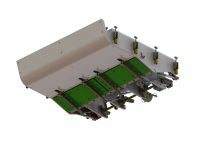 The Transland Switchback system is STC’d for Thrush 510 aircraft. Coming soon to other aircraft models. New Fire II DynaNav Touch Screen Controller with capability to control both the ag and fire gate from a single unit. Complete Spray System with Pump, Spray Valve, Booms and Center Boom. System Also Available in Separate Configurations. Speak with your Transland Dealer for what works for You!